The menace of electoral rigging has become a sure route to electoral victory in Nigeria, subverting freedom and fairness in the process and as such, as the date of the forthcoming general elections draws closer, candidates are not relenting in ensuring all loose ends are tied in making sure victory is on their side. In the bid to win the imminent elections, SecretReporters gathered that the ruling All Progressives Congress (APC) may have gone all the way to ensure that victory is theirs in the coming days by allegedly inviting external parties to boost their support base during campaigns. This is evident as delegations from nearby Republic of Niger who flew into Nigeria on the 30th of January 2019 were spotted at the recent rally held by APC in Kano State to give their support to the APC presidential candidate, Muhammadu Buhari. However, after a negative public outburst, the APC government denied that the Niger delegates were not in Kano for the rally against public notion but rather for a cross border security meeting. 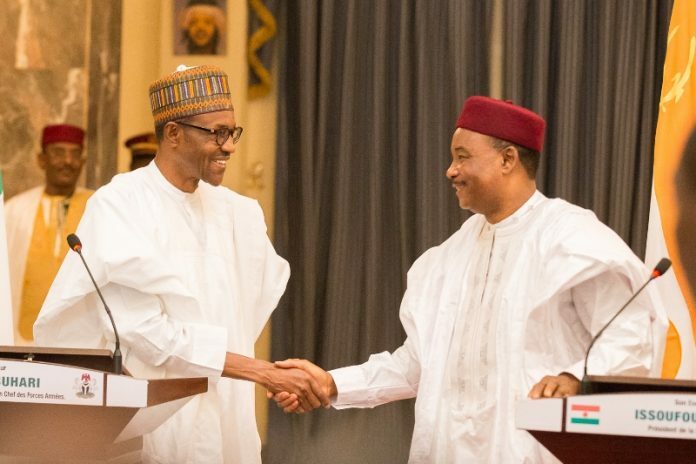 Hard evidence made available to our newsroom reveals otherwise as it was clearly stated in an alleged official document issued from the office of the President of Niger Republic that delegates sent by President Mahamadou Issoufou were to attend the campaign of Nigeria’s President Muhammadu Buhari. 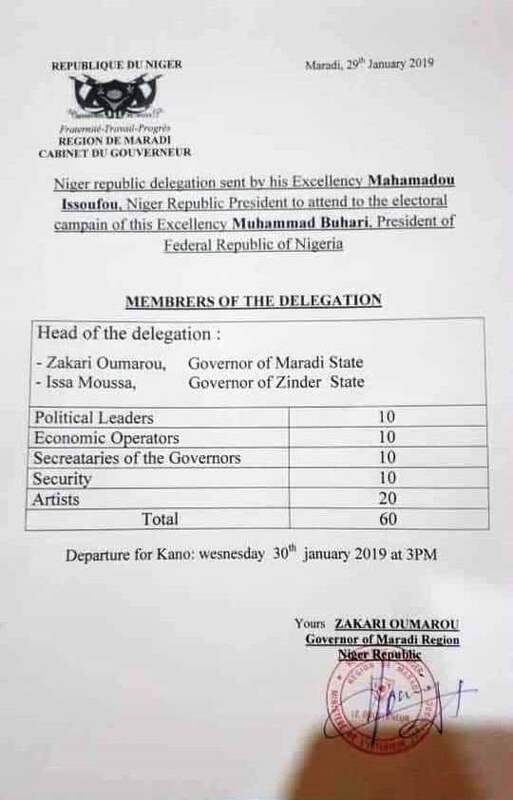 According to the document, the government of Niger Republic which has since formed an alliance with the APC led Muhammadu Buhari’s government, in pledging their allegiance and support to the incumbent president allegedly sent 62 delegates consisting of two governors heading the delegation: the Governor of Maradi state and the Governor of Zinder state alongside 10 political leaders, 10 economic operators, 10 secretaries of the Governors, 10 security personnel and 20 artists. This action by the ruling party may has stirred the political tension in the nation as they are been accused of purchasing people from neighbouring countries who might have crossed through Nigeria’s porous borders to vote for the APC presidential candidate in person of Muhammadu Buhari as many especially the opposition parties are of the opinion that the government of the day that claims to fight corruption may actually be at the frontier of breeding corruption. Tensions are also heightened among electorates that the forthcoming elections might be far from a free, fair and credible election as it had already been decided in a strategic alliance even before it started allegedly due to the involvement of foreign countries in political campaigns which should be solely an internal affair.